As soon as the festive season is coming to an end, Singapore jumps right into the next big event. The decorations and shop displays magically change overnight and so do the songs, turning from “Jingle Bells” to “Gong Xi Gong Xi”. 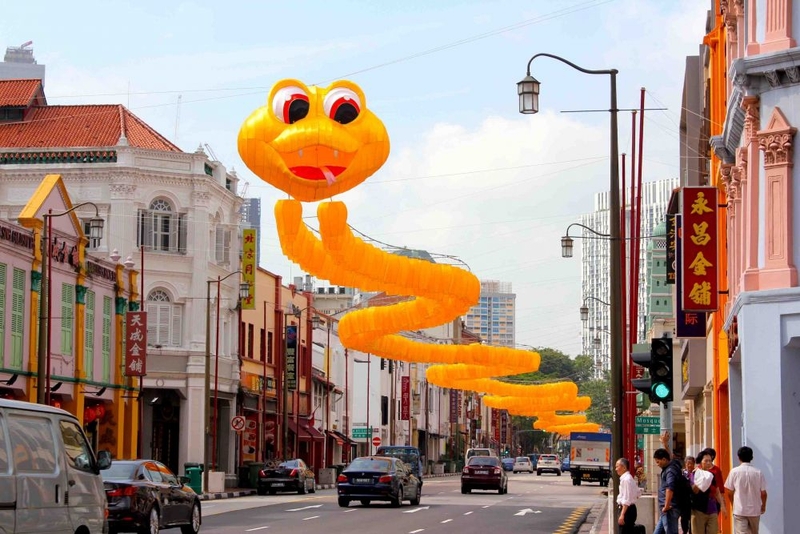 It’s Chinese New Year, the biggest celebration among Singapore’s large Chinese Community and the only time of the entire year when most shops and restaurants close down for three full days. Chinese New Year, also known as Spring Festival or referred to as Lunar New Year, celebrates the beginning of the Chinese calendar. In 2013 it falls on the 10th of February and families gather during that day for their annual reunion dinner. As the most important and significant festivity of the year, it is considered as a major event and public holiday. According to mythology, the beginning of Chinese New Year started with Nian, a beast that would come on the first day of the New Year to each livestock, crops and children. For protection, the villagers would put food in front of their doors. Once, people saw that the Nian was scared away by a little child wearing red. Hence, they would hang red lanterns and spring scrolls on their windows and doors, which is one of the main traditions until now. A must for every visitor and local alike is Chinatown, of course. The ethnical enclave is a great place to visit throughout the entire year, yet around Chinese New Year it takes on even more charm with a busy and expecting atmosphere. 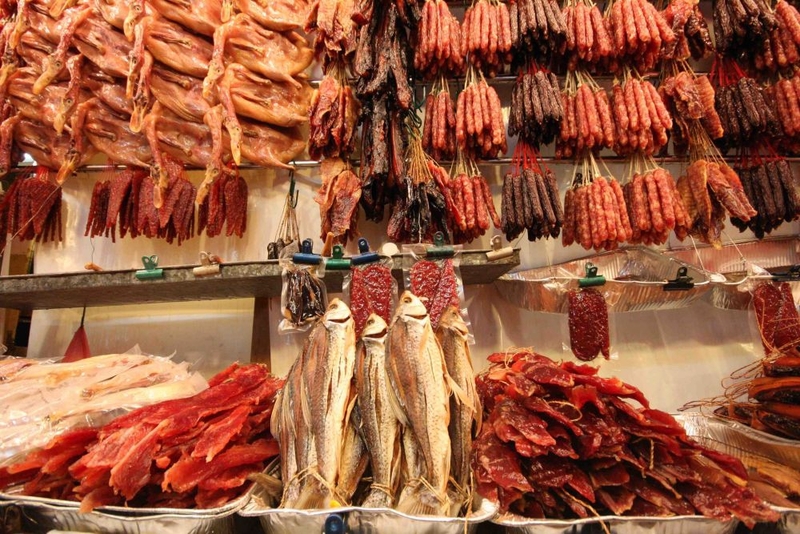 Thousands of lampions light up the charming streets, hundreds of stalls sell fake firecrackers, special sweets, auspicious fruits and Chinese delicacies such as dried duck, fish and pork. Decorations ranging from lampions, door blessings, good fortune paper cuts, fake coins are sold at every corner. Wherever you look and go, the two auspicious colors red and gold dominate the entire district. 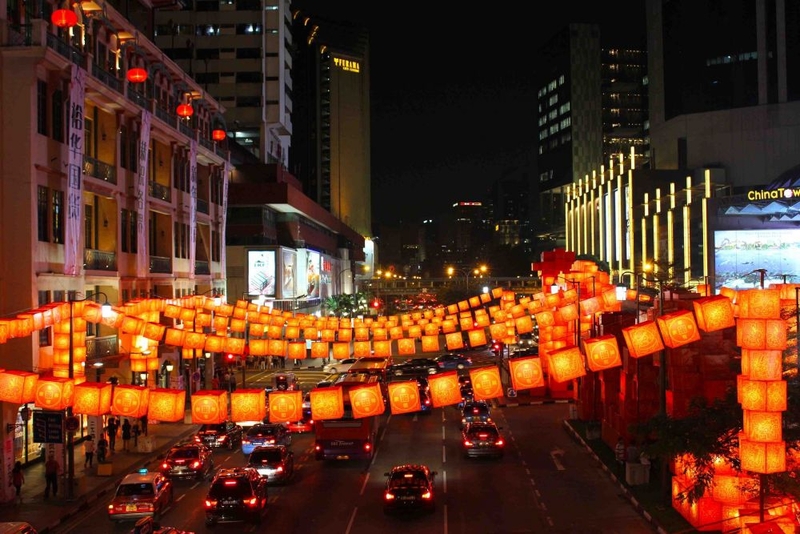 Evening is the best time to experience Chinatown and we recommend to set a few hours aside to stroll along the streets, shop for some souvenirs and to enjoy a local dinner at either Chinatown Complex or one of the street food stalls Singapore is so famous for. Another place to visit is the scenic Singapore Chinese Garden, located at the shore of the beautiful Jurong Lake. The impressive Pagodas, the charming white bridge and the large lanterns and decorations throughout the park are truly amazing for both children and adults. It’s a great alternative to the busy and usually crowded China Town. Our last recommendation for you is to visit a Chinese Temple such as the Thian Hock Keng temple. Many Chinese visit a temple around Chinese New Year to pray for a good year ahead. To chase out evil spirits, sweep away any ill fortune and make way for good luck, many families will thoroughly cleanse the entire house, buy new decorations and even paint the walls. This “cleaning” also includes personal issues and people will settle their debts and forgive grudges to really start the New Year with a clean slate. However, on the first days of the New Year it is strictly forbidden to clean or even touch the broom as the good luck might accidentally be brushed away. For wealth, longevity, happiness and good fortune the windows, doors and entrances of homes and offices are decorated with bright red and golden paper cuts, fake firecrackers, glittering gold coins and auspicious flowers. It’s lucky to wear new clothes in bright red, especially for children. Many stalls in markets offer lovely traditional clothes in red with delicate golden embroidery. An important custom is to give “hong bao” – a red - golden envelope containing money. When doing this, it is imperative that the amount does not contain the number 4, which in Chinese sounds similar to the word for death and is therefore regarded as bad luck number. Ideally, the amount has the number 8 in it, being the luckiest number. Married couples give hong bao to their children and parents as well as to other children and adult singles of the extended family. Banks during Chinese New Year are extremely busy with many people queuing for up to one hour to get crisp new notes. A typical Singaporean tradition is Yu Sheng, a delicious salad made of raw fish and shredded vegetables topped with a variety of condiments and sauces. Families, friends or colleagues would then gather around a table to toss the beautifully arranged ingredients high into the air with their chopsticks while shouting auspicious wishes. The higher you toss, the more prosperity you can expect. 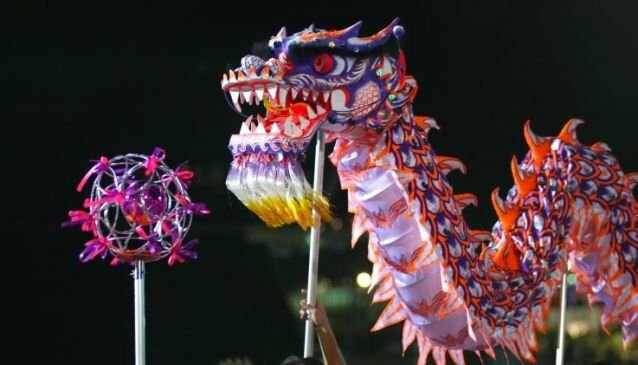 The highlight of Chinese New Year is to experience a Lion or Dragon Dance. 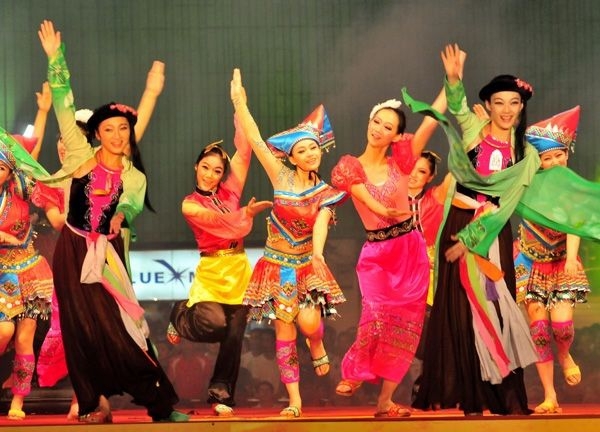 Troupes from Chinese martial art schools visit houses and shops to perform “cai ching”, a dance translated as “plucking the greens”. Accompanied by drummers, the lion dances while approaching a plate with lettuce, oranges and a red envelope. When the lion is done eating the greens he “spits” them out, leaving them in a nice arrangement such as the form of an auspicious character. But the lion keeps the red envelope, which is the reward for the troupe. Both the lion and dragon dance are an important Chinese tradition, performed not only during Chinese New Year but also at business opening events, weddings and important receptions. The dance usually takes between 20-30 minutes. Take public transport if possible, especially when traveling to and from Chinatown. The area is extremely busy during Chinese New Year and queues for taxis are very long. Be considerate when entering a Chinese temple and respect that people praying might not want to be photographed. No special clothing required.